People who follow me might be familiar with my interest in pareidolia. That’s the propensity to make up words that sound filthy. I kid . . . it’s the propensity to resolve random patterns into familiar objects. In my case, faces. There are examples dispersed in various posts of mine, THIS being one such post. In that particular case, I used a computer program I own, Portrait Professional Studio 15, to “facilitate” the visualization so that others might enjoy the same ability. A favorite activity of mine is capturing photos of bagel slices that incorporate the likeness of faces. In the case of bagels, I tend to draw freehand on the photos to “bring out” — so to speak — facial features. THIS post has a good number of examples and it also contains my work with muffins. Why do I bring this up? Because I lied about not doing any Deep Dreams for a while. You see, I ran a bagel face through Deep Dream . . . In case anyone wonders what the two originals look like, let me tell you. This is the original bagel photo . . . It was then modified using Pixlr to generate this . . .
And merged with this photo . . .
Well, when I saw that, I immediately ran another bagel face . . . If you went to the linked post, you would see that this muffin . . .
. . . was transformed into this . . . Naturally, I wondered what Deep Dream might do with such an expression of high art . . . I have to admit . . . I was hooked, in no small part because I’d tried bagel and muffin faces before and had not been impressed . . . But now . . . now I’d stumbled on the equivalent of my very own Sutter’s Mill. I started hunting down all the bagel faces and muffin faces I’d ever done . . .
Now, I know that me dumping them all on here might overload the senses and throw people into fits of ecstatic bliss, but I figure it’s best getting all these out at once rather than dole them out a few at the time. Yes, that goes counter to everything they tell you about keeping readers happy and interested. My way — or so I’m told — has people’s eyes glaze over, their brains shutting down, and some even decide to go into politics. Slack-jawed, they look a bit like this . . .
. . . their vacant eyes staring into the infinity of nothingness, their drool solidifying onto their ashen cheeks as if limpid lakes of mother-of-pearl, and in general taking on the appearance of modern legislators. Of course, some readers get all excited with the oddness of it all . . .
. . . and want nothing more than to run outside and tell everyone! Seriously, who wouldn’t want a copy of their very own bagel vampire? Or, a baby bagel cyclops? I even had an (unintentional) likeness of a certain mad Dicktator . . . Some of the artwork is not changed much while still — in my opinion — improved overall. The scary part is that I have something like 30-40 unmodified bagel photos just waiting for faces to find their way into them, and once I do, yep, I’ll be Deep Dreaming them. Some obviously dread the coming onslaught . . .
. . . while others appear overjoyed . . .
. . . or, maybe, perplexed. I guess one can see whatever one wants in these fine examples of the fortuitous synergy of food, art, and computing innovation. Most of my bagel faces bear no resemblance to actual food . . . er, faces . . .
. . . but some occasionally evoke images of actual fake characters. Like, for instance . . . I think that looks like Mrs. Doubtfire . . . I could be wrong. Often, one Deep-Dream-modified muffin face can be mistaken for another. 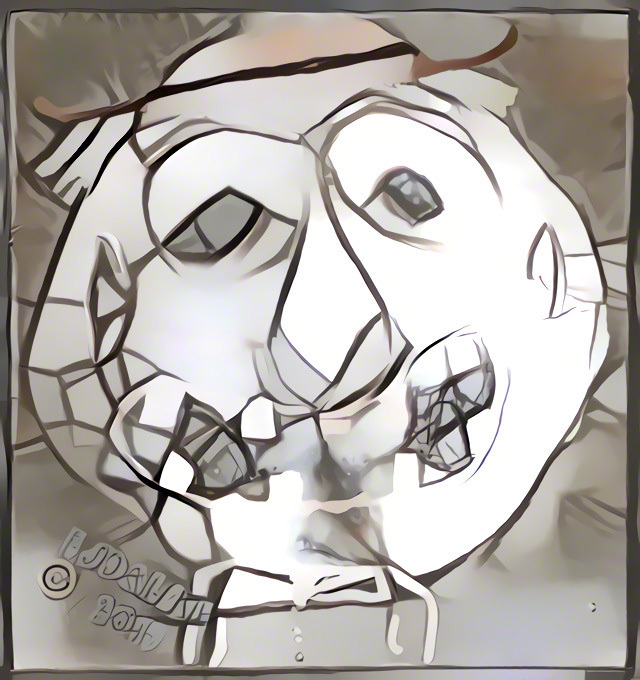 Of course, there’s now added pressure to come up with not only original artwork for my many bagel faces-to-be, but to also make them Deep Dreamable. Then again, none of these were planned, so maybe I shouldn’t worry too much about it. The worst that can happen is that I don’t produce anything interesting, and if that’s the case, it’s not like anyone would know. As many might think this last bagel face is a self-portrait, I will remind people that I’ve not worn ties for many, many years. For that matter, I don’t have that much hair. Anyway, I notice most readers are yawning . . .
. . . and their eyes are starting to cross, so I’ll stop. As usual, I’ve added these to the massive Deep Dream SmugMug Gallery HERE. Here’s the gallery of the above faces . . . This entry was posted in Effects and Filters and tagged Bagel faces, Deep Dream, food faces, muffin faces, Photographs, Photography, post-processing. Bookmark the permalink. That is so funny, but you probably do need help! Only jesting of course! No, no, I agree; I do need help.
. . . please send donations in small bills. No coins as they make noise in my pocket that distracts me from my art. Well, I just learned a new word! Thanks, Disperser. Deep Dreaming Food Faces! I love it! These made me laugh! Oh, gosh! I have pareidolia! But, didn’t know what it was called until you shared the link! Thanks! Someday these will command reverence instead of laughter, but for now, I’m OK with laughter. Thanks, diem3. The yawning bagel reminded me of our beloved (by some, on both sides) president. SAD! I don’t see it — no signature hair swirl — but that’s the beauty of these . . . people can see in them all manner of things. I enjoy going to art fairs and these bagel faces remind me of some of the unique art I’ve seen there. Seriously, I think a booth filled with these images would draw a crowd!
. . . and possibly some mental health professionals. Seriously, thanks, and yes, I find these visually interesting, but then I’m easily amused. Tell me ej; do you actually eat this stuff after desecrating, it or just chuck it i the garbage? Do you have any idea how many starving people in the world would love to eat this stuff before, even after you have finished with it? One thing that is never wasted at our house is bread in any of its forms. Bagels are photographed precisely because they are about to meet their demise.
. . . most are grateful for the few extra moments they get to enjoy their undigested form and shape . . . Strange. It stimulates my artistic sensibilities as well as my appetite. It’s alimentary . . . food and art have been intertwined since the very first hunts were crudely drawn on cave walls.
. . . perhaps people posting their meals on Snapchat and Instagram are not much different to humans of long ago, except that our ancestors had a difficult time sharing their pictures. Then again, theirs lasted much longer than ours will. I’m not crazy after all! I feel as though I should be refunded my money for all the time I spent talking to that damn therapist, when all along she probably knew it was nothing more than pareidolia! Thank you for sharing you’re special interest and excellent examples. Now, now, let’s not get too hasty . . . photos are no indication of one’s sanity. At best, they’re an indication of one’s peculiar interests.